1. Bolts between existing shaft flanges. 5. Reduces engine noise and vibration. Couplings as standard are non-conducting but we can supply a silver impregnated rubber element to fit in the centre of the coupling between the two fail safe straps to give continuity if required. The R&D 910 Series couplings consist of a contoured flexible disc moulded in tough yet resilient new type polyurethane. The contoured disc gives clearance for the bolt heads, and is able to flex freely to take up any temporary misalignment of the engine and shaft, due to flexing of the boat structure or the engine moving on its rubber vibration isolation mountings. Forward thrust is taken in compression on the disc between the two half couplings and reverse thrust is taken again in compression on the disc between the two fail straps. In the unlikely event of a disc failure the steel straps make the coupling fail safe and ensure drive is maintained in both forward and reverse. 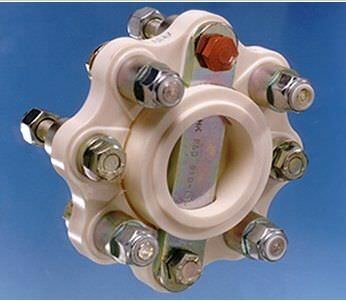 The 900 series couplings use flat discs and contoured castings with a central high tensile bolt to take reverse thrust, they are also fail safe.